Integrative medicine is grounded in the definition of health. The World Health Organization (WHO) defines health as “a state of complete physical, mental and social well being and not merely the absence of disease or infirmity.” Patient centered care is the core belief of integrative medicinal approach and addresses the full range of physical, emotional, mental, social, spiritual and environmental influences that affect a person’s health. Employing a personalized strategy that considers the patient’s unique conditions, needs and circumstances, it uses the most appropriate interventions from an array of disciplines to heal illness and disease as well as regain and maintain optimum health. Through personalizing care, integrative medicine goes beyond the treatment of symptoms to address all the root causes of an illness. In doing so, the patient’s immediate health needs as well as the effects of the long-term and complex interplay between biological, behavioral, psycho-social and environmental influences are taken into account. With a growing demand in the field of Integrative medicine, it can be considered a global priority in the research and development of long term, cost effect medical care and disease management. Pain management has become a major challenge for the health care provider communities as well as for thousands or patients. On one hand pain has increased in various areas – from Rheumatoid Arthritis to Cancer to sports medicine. Usage of opioid has significantly increased in last one decade. However, it has become a challenge as well in the form of drug overdose and abuse. Recent studies indicate that over 30% of the American population ages ranging from 12 – 75, suffers from chronic pain. The gold standard for pain management are opioid group of drugs, however with the rising incidence of opioid dependency and abuse, alternative methods are in demand. Drug overdose is the leading cause of accidental death in the US, with 55,403 lethal drug overdoses in 2015. Opioid addiction is driving this epidemic, with 20,101 overdose deaths related to prescription pain relievers, and 12,990 overdose deaths related to heroin in 2015. Curtain Raising Event for the International Day of Yoga 2017. Dr. Robert Schneider, Dean and Director, College of Integrative Medicine, Institute for Natural Medicine and Prevention, Maharishi University of Management, IA. Mrs. Latha Mangipudi, State Representative, New Hampshire. 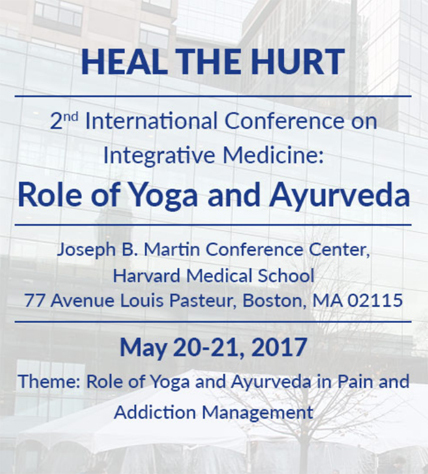 Dr. Nitinga Desai, Member of Special Commission to Study the Incorporation of Safe and Effective Pain Treatment, Governor of Massachusetts. Dr. Anusha Sehgal, Ayurvedic Practitioner: Demonstration of Ayurvedic First aid care and simple pain management techniques. Note: You can use your PayPal account or Credit/Debit Card using the same PayPal payment system. Ayurveda and Yoga are systems that approach an individual as a microcosm considering all aspects of their being such as their diet, lifestyle, relationships, metal health, spirituality, and environment and assessing its influence on quality of life and happiness. Both systems originate from the Indian subcontinent and has been proven to reduce pain, heal the root causes and also help rehabilitation for those whom are suffering from over-use or addition. Yoga has become mainstream and is widely utilized for therapeutic yield specifically in the management of pain. Ayurveda has long employed natural resources for the reduction or curative effect in various ailments resulting in acute to chronic pain. The purpose of this conference is to address the solutions to these key issues to transform the healthcare of the emerging world with integrative approach bringing ancient systems of Yoga and Ayurveda and modern medicine together via research and development and proper education. This event is bringing together worlds experts in the fields of pain and addiction management to address these issues, construct a proper strategy and plan for implementation in the US and India.